Meet Nikkolas Smith, the man who created this powerful image. Concept artist Nikkolas Smith, 28, created this powerful image of Martin Luther King Jr. in a hoodie to express support for Trayvon Martin. Smith spoke to BuzzFeed about the image he created a year ago, which took on a life of its own and blew up online after the George Zimmerman not guilty verdict. "I created this image when George Zimmerman first killed Trayvon Martin," Smith says. "There was this whole national outcry, a hoodie movement and everybody was rocking their hoods and everything. Just trying to get that message out there about what is considered suspicious. Is my black skin considered suspicious?" Former Obama administration official Van Jones shared the image after the verdict, which began its circulation again. The rapper Common shared a version which had more than 8,700 likes and 1,800 shares. Smith says the fact that they were both Martins spoke to him and he believes MLK Jr. definitely would have supported the slain teen, though some online have called the image disrespectful. The image was all over a search for #MLK on Instagram. Born in Texas and living in Los Angeles, Smith says the image resonates because "MLK is the most iconic figure." But he also believes supporters who are angry about the verdict have a different outlet than they used to. "In the 70's and 80's maybe running around in the street was the only way to vent. But now we have social media," he says. Smith shared different versions online along with this quote. He titled the image April 4, 1968, the date MLK Jr. was killed, and coincidentally, also Smith's birthday. One of his captions for the image is "Suspect or Saint?" "I write that because you don't know who these people are," he says. 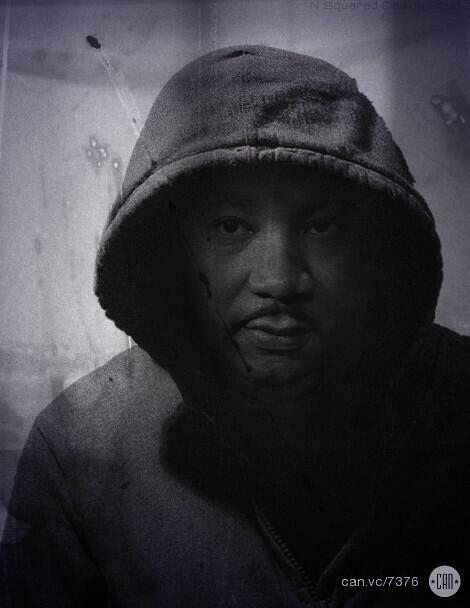 "You don't know if you shot the next Martin Luther King."